1. Short at 1.2976. Closed due to new crossover at 1.3003. 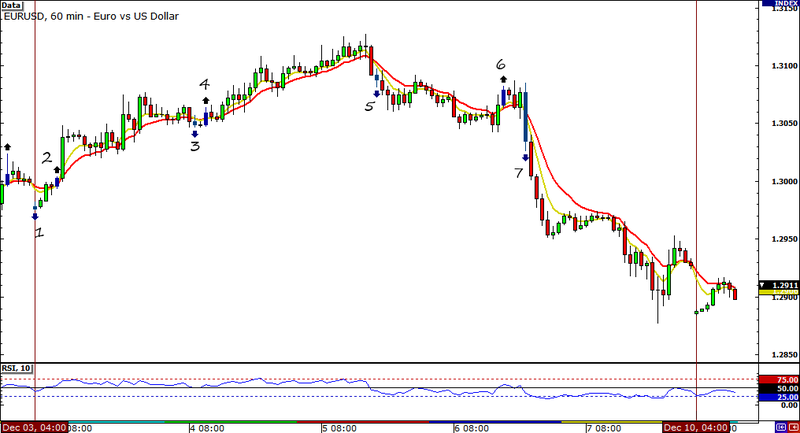 -27 pips. 2. Invalid signal since RSI was already above 50.0 in the candle prior. 3. Invalid signal because RSI was above 50.0. 4. Another invalid signal since RSI did not cross the 50.0 level from below. 5. Invalid signal as RSI was already below 50.0 prior the crossover. 6. Invalid signal. RSI already above 50.0 prior the crossover. 7. Short at 1.3035. Closed at 1.2927 when 50-pip trailing stop was hit. +108 pips. Total net gain in pips for the week: 81 pips. Pretty awesome right? That makes two straight weeks of solid gains. Let’s see if the streak will continue as we head deeper into the holiday season! 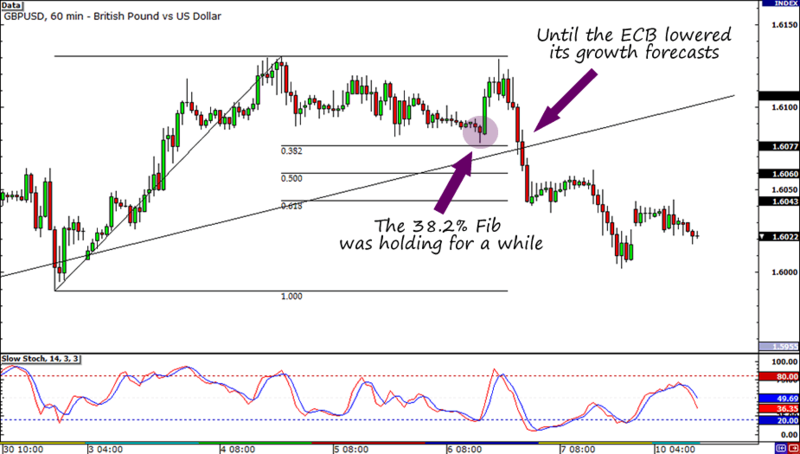 Looks like the second time wasn’t the charm for my GBP/USD trade! Just when I thought that the 38.2% Fib on the 1-hour chart was going to hold up well after the BOE’s interest rate decision, ECB head Mario Draghi triggered risk aversion when he stepped up on the stage and told us that they downgraded their growth forecasts for the region! Boo! I probably could’ve avoided a loss or at least limited my losses if I had cancelled my orders when the pair was consolidating around its previous highs. Or maybe I could’ve closed my trade when GBP/USD convincingly broke below the rising trend line. But darn, it was such a good trade idea at the time! Right now we’re looking at a 45-pip loss worth 1% of my account. A pretty pricey way to remind me not to get too attached to my biases, huh? Ah well, sometimes that’s just how the cookie crumbles. I’ll do better this week… hopefully!